The proportion of this is more vegetable than quinoa, because a head of cauliflower is generally bigger than the crown of broccoli that I get from my grocery man a.k.a. the sweetie man. I use the whole thing because, you know, whole foods. And it keeps things interesting. I mean, I'm easily interested. And you know if you're cutting out starch, you can omit the quinoa and still have a delicious bean and vegetable salad, or if you're really cutting out starch, you can omit the beans and have a really delicious vegetable salad as a side to your mammoth drumstick or whatever you hunted down. Measure vinegar into a large bowl and add a generous amount of salt and pepper, and a little bit of minced aromatics like onion or shallot or garlic if desired. Drizzle the olive oil over the vinegar and whisk it in. Rinse and drain the chickpeas and marinate them in the vinaigrette. Trim and cut up the cauliflower into tiny florets and slivers, and drain and dice the hearts of palm. If you made a double recipe of chickpeas, put away about two cups for green salads. 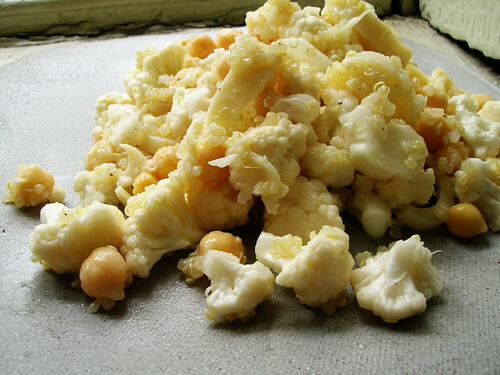 Toss the cauliflower and hearts of palm with the rest of the chickpeas and vinaigrette. Put the quinoa and water in a pan over high heat. Bring to a boil, lower heat and simmer for fifteen minutes. Remove from heat, fluff it up a bit, and add it to the marinated chickpeas and vegetables.